Acta Médica Portuguesa (AMP) is the scientific jounal published by Ordem dos Médicos (Portuguese Medical Association). The aim of Acta Médica Portuguesa is to publish original research and review articles in biomedical areas of the highest standard, covering several domains of medical knowledge, with the purpose to help doctors improve medical care. In order to accomplish these aims, Acta Médica Portuguesa publishes original articles, review articles, case reports and editorials, among others, with a focus on clinical, scientific, social, political and economic factors affecting health. All submitted manuscripts are subject to peer review. Regarding the use by third parties, the Acta Médica Portuguesa is governed by the license Creative Commons ‘Attribution – Noncommercial - NoDerivatives (by-nc-nd)’. Acta Médica Portuguesa was established in February 1979. In 1987, the journal was acquired by the Southern Regional Section of the Portuguese Medical Association. In March 1989, it became the official scientific journal of this institution. Since 2004, the journal has been available only in digital format. In the year 2018, around 1100 articles were submitted through our site . A. Galvão-Teles (1978-1987), F. Veiga Fernandes (1987-1993), A. Sales Luís (1993-1996), Carlos Ribeiro (1996-1998), J. Germano de Sousa (1999-2004), Pedro Nunes (2005-2010), Rui Tato Marinho (2011-2016),José Manuel Silva (2017). AMP is one of the six Portuguese Medicine journals indexed in MEDLINE, which is clear recognition of their scientific importance as a publication in the area of medical sciences. It is the oldest known Portuguese medical journal indexed in that database. The indexation occurred in 1979, under the supervision of Editor-in-Chief Prof. Alberto Galvão-Teles and carried out by a team composed of Prof.s Cândido de Oliveira, Machado Macedo and Armando Sales Luís. Besides the indexation in PubMed/Medline, another major requirement for international scientific publications in the medical area is the Impact Factor awarded by ISI Web of Knowledge (Journal Citation Reports: Thomson Reuters). Acta Médica Portuguesa’ first Impact Factor was granted in 2010 (0,256). Acta Médica Portuguesa is ranked 129 amongst 151 publications listed under the classification Medicine, General and Internal (2010 data). SHERPA/ROMEO. AMP is filed as a green level publication in this database, where any author i sable to file their preprint, postprint or editor’s PFD version of their articles. Abstracts of 3800 articles published on Acta Médica Portuguesa already available through PubMed/Medline. The total contents of the journal are available for free on MEDLINE (“linkout journal”). 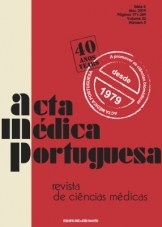 Each year, more than 85 000 copies are downloaded from the contents of Acta Médica Portuguesa.